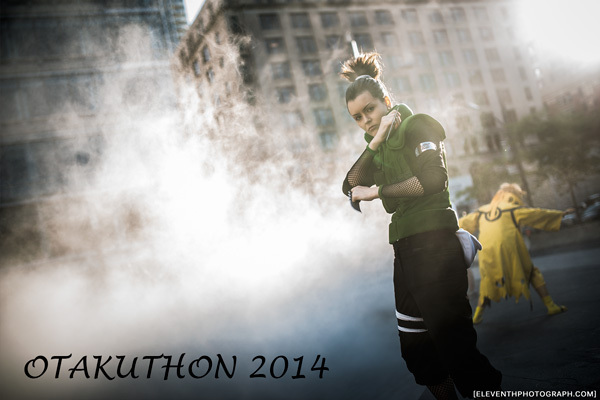 Otakuthon is an anime convention that takes place at the Palais de Congres in the Canadian city of Montreal. This year I had the pleasure of having a nice quiet drive up to the con by myself and my playlist. Otakuthon is one of those conventions that just isn't english, it's mainly french, but with a slice of english; still not enough to get me purchase any french manga though. The drive down to Montreal wasn't all that bad, bar the almost rear-ending of the woman in front of me when she slammed her brakes at a red light. I love Otakuthon for a number of reason, the first is how close the hotels and parking lots are! Every year I easily manage to get the parking in the same lot and the hotel is almost always across the street. Very convenient for the cosplayers with bulky costumes. Otakuthon is still a smaller convention but growing at a rapid pace. For reference, the attendance this year was about 17.5K (about 4k more than last year), and pretty much double of that from 2011 (when I first attended Otakuthon). The Friday afternoon/evening this year did feel congested in the main lobby area, I was surprised how busy it was all three days. I'm willing to bet the presence WCS had a bit of influence on the numbers, for good reason! As was stated in my Photoshoot journal, I had a ton of requests for shoots at this con, with the selection of beautiful locations to shoot at I can't blame them haha. Unfortunately I had to dwindle it down to about 13 which is less than half... A lot of awesome costumes this year, definitely a step-up from last year. I had a nice group of Sailor Moon scouts to shoot, we shot at the one fountain a bit up north, but took the bad alley full of homeless on the way back. There was a pack of like 20, some making cat-calls at the scouts. That's why I tried to take the group around but hey! Right after I headed back to the hall for the WCS (World Cosplay Summit) event. A total of 8 teams made it to the finals, but only one, could be crowned champion. Congrats to Detailed Illusions and Messy Mia (Team Detailed Mess) as the Grand-Prize winners, with MeltingMirror and CosplayCalamity (Team Polar Diamond) as the Runners Up! I did photograph both WCS event and awards ceremony on Sunday, lots of emotions at that one! : ) The winners will be going to Japan in 2015 to represent Canada in a "Observer" status! A few notes I'd like to mention, Otakuthon seems to always have the greatest number of interested passerby's who love to check what's going on. For the most part this is fine, but this also means there's a bigger number of people who aren't as sure how to approach/interact with the community. You have the drivers who race by who scream something completely incoherent, or the model-wannabe's with ego who have to have a photo with whatever attractive female cosplayer he lays eyes on. To me there was a particular situation when an older gentleman with a DSLR/Bridge camera entered my bubble. My bubble has two modes, Soft&Warm and Adamantium-Spikes. It was during the afternoon at the ever-popular fire fountain, a decent number of people where taking pictures and doing their thing. While I'm doing my photoshoot, this man insisted on taking photos from many angles (without asking or saying anything I might add) of the various cosplayers in the area, then came to mine. I bumped into him TWICE because he was in my bubble. First time he was to my 7 o'clock and bumped into him while moving over a bit; I looked right at him raised my hand and smacked him remarked "C'mon". Went back to shooting, a few moments later I'm backing up to get some distance and I bump into a body/hands holding a camera. I turn around raise both my hands and smack him harder in a loud voice say "Can you give me some room buddy?!" He wasn't part of the con, but he also didn't have common-sense on where to place himself when taking pictures. I noticed one other instance when watching a photographer friend of mine taking some shots and another photographer holding a light stand asks him if he can take a shot/how much longer he's gonna be, to which he annoyedly replies 10/15 minutes. The other photographer more or less scuffs at that and walks away. Again, this topic will probably come forth in a future article, I want to talk more about it. I had a fun dinner on Friday night with a bunch of cosplayers and friends, we did finally manage to find the restaurant after a good while of deliberation and navigation. Lots to choose from all nearby. I was rooming with the superstar VickyBunnyAngel and her BF at the Embassy Suites hotel and they had free breakfast in the morning. That was a nice Kudos to save on money and walking time. Though the eggs resembled gelatine, the bacon more than made up for it. I even managed to get a pull-out couch this year! : D Definitely an upgrade from last year's tile floot+couchcusions & carpet nights. Saturday night I visited two party rooms, they were both in the same hotel, same floor, right beside each other... which made it convenient. It was an interesting contrast in the types of people each room had. It's an unfortunate reality, but there are a lot of homeless around the city and some of them make you feel a bit cautious when wandering alone at night. I think that about wraps it up for my post. I do some tweeting during cons, so be sure to follow me if you're into that. Be sure to check out the Con Gallery for all the photos I took, you may find yourself! Thanks for reading the lengthy post!